A month ago, I was living out of my car in Arizona. I was finishing up some lab-work after a seasonal ecology job and the rest of my crew had already left, including the guy whose house I’d been crashing at. Technically, I had the money to stay in a youth hostel, but not by much—I was getting paid above minimum wage but due to the tedious, repetitive motions required for the work, it was almost impossible to work for more than four hours a day. This meant if I wanted to stay in a youth hostel, I would spend more than half my daily earnings on housing alone. To my cheapskate 23 year-old self, this was an unacceptable sacrifice. Lets start with this fact: I am incredibly privileged. I am a white, college-educated cis-woman coming from a financially stable background. Living in my car was more like a string of inconveniences rather than a real, inescapable poverty-driven homelessness. So yes, I did have a choice in the matter, but nevertheless for a short time I did not have a home. When I needed to eat, I bought food that did not require preparation in a kitchen. When I needed to use the bathroom, I found a public building or went in the woods. These privileges simultaneously reinforce our ability to remain securely housed, while creating barriers to vital resources for people experiencing homelessness. I don’t have any grand theories about how we can stop homelessness. Rather, I just have five things to share with you that I never expected to learn in two short weeks. There are so many different ways to be homeless, as I picked up from all the characters in the Walmart parking lot where I stayed sometimes. There’s the kind of homeless where you have friends and family with couches you can crash on. There’s the kind where you have a car to sleep in and you can use to get to your job, if you have one. There’s the kind where you have enough money to buy food, but not enough for a place to stay. There’s the kind of homelessness where you have a sleeping bag for the cold weather, and there’s the kind of homelessness where you don’t, where you spend the coldest nights strolling around 24-hour stores and sleep during the day when it’s sunny and warmer. All kinds of homelessness are hard. Some kinds are harder than others. 2. Feeling secure enough to sleep soundly through the night is a giant freaking privilege. Living out of my car absolutely wrecked my ability to sleep soundly. When I was in parking lots, I’d always be half listening for the knocks of store employees or the police at my window telling me to go away. When I slept in national forests, I’d always keep myself half awake, straining my ears for the approach of someone who might want to break in to my car and rob me. And this in my locked car. I didn’t have to sleep out in the open like some did. I probably would have been fine, but I have a very well defined worry-streak. And as a result, I dragged bleary-eyed and exhausted through most of my days. Sometimes I was so tired I felt like I was losing my mind. I found, to my annoyance, that even though I had a skillet and a camping stove, there were very few places I felt comfortable cooking my dinner. Usually, I have no qualms about doing ridiculous things in public, but having a kitchen was always such a basic part of my life. Cooking was a human need that I have never really had to do in a parking lot or a playground. I usually ended up driving out to a patch of forest to make dinner under the cover of trees, spending more time and more money on gas. This is a story in and of itself, so I wont bore you with the details. Let’s just say that one time, someone called the police on me because they thought I was a “transient” (as the police call them, apparently) living in the university where I worked. When the police came, they demanded to know my Arizona address and I told them I didn’t have one. When they demanded to know where I was staying, I foolishly told the truth, that I was sleeping in my car. They latched on to the fact that I did not have a residence, and I had to spend about ten minutes trying to convince them that no, really, I was not sleeping in the building. They would not believe me. After all, who would sleep in 20-degree weather when they had access to a heated university building? Through the whole encounter, I kept thinking how lucky it was that in that moment, I was a white female, small enough to be non-threatening to the cops. I wondered how the encounter would have gone if I had been older, if I was a person of color, or if I wasn’t able speak like the educated college graduate that I was. It probably would not have gone as well. 5. 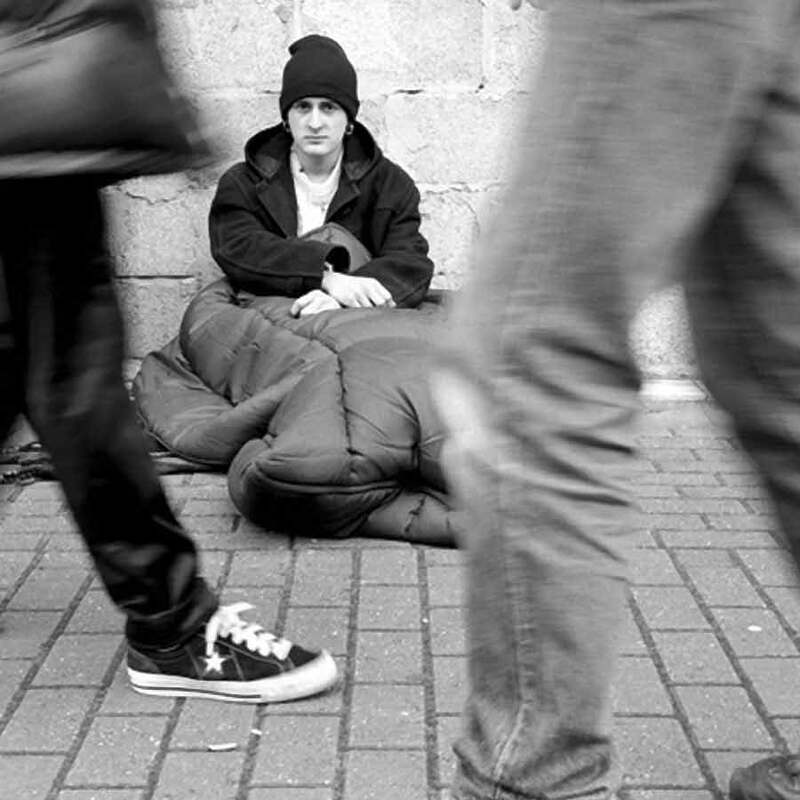 Once people realize you might be homeless, you become invisible. OK, I knew this one already. But experiencing it is very different. I admittedly looked a little rough, and maybe didn’t smell that great. But I wasn’t that much worse than the unkempt forestry students in the university where I worked. Sometimes I even put on earrings. So fancy! So in most contexts, no one would guess I was living out of my car and people made eye contact with me and smiled like normal. 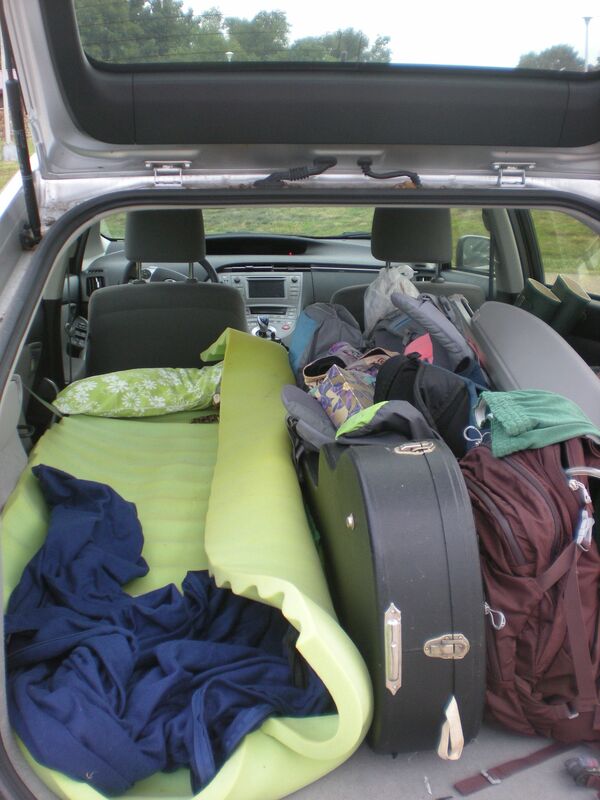 But sometimes, (frequently) I had to rearrange my belongings in my car to keep the chaos of my possessions from spilling over to my makeshift bed in the back. Time after time, I saw people walk past me and make eye contact and smile, then look at my car and realize I very obviously lived in it. Their eyes would glaze over immediately and they would walk on, staring through me. I felt like a ghost. It was not my imagination either, it happened again and again. I don’t have any grand ideas to end homelessness. But from now on, I make eye contact with everyone. Awesome post! I’ll have to check out “Unpacking Housing Privilege.” Working in a social services-adjacent field, I’ve absolutely noticed some of those barriers to resources for homeless individuals. For example, in order to get into a homeless shelter at night, you would have to spend ALL DAY at the Department of Social Services in order to get approved to stay in said shelter. When your days consist of wake up –> go to DSS –> spend all day getting approved –> go back to homeless shelter, all the while relying on shaky public transportation (because this is Long Island), how in the world are you supposed “pick yourself up by your bootstraps?” There aren’t enough hours in the day to then get job training or hold a job, assuming you’re lucky enough to get hired without a permanent address. Thank you for this article. You’ve helped me check my privilege in such an important area. Eye contact for everyone!! FYI- the housing privilege document you linked to was created by We Are Family (https://www.facebook.com/wearefamilyseattle), not the Seattle Mennonites.